A Pair of Engraved Whisky Tumblers with Swarovski Crystal detail. 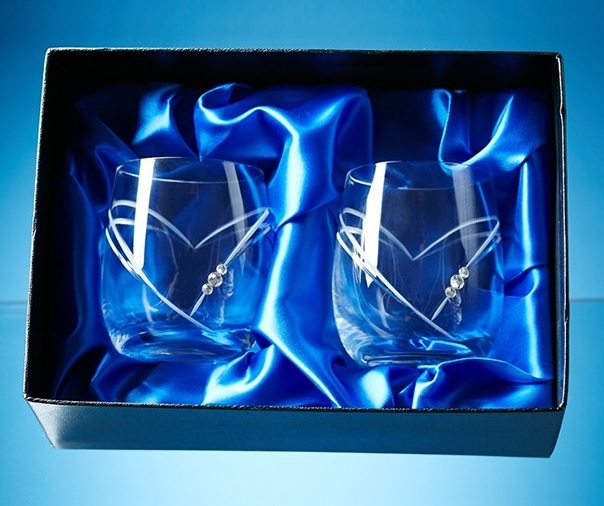 The Whisky Tumblers are a delicate curved design with a double heart shaped cutting and 3 Swarovski crystals. They would make an ideal engagement, wedding or anniversary gift. The set comprises of 2 whisky tumblers and the engraving is done within the heart shape. They are packed in a blue lined high quality gloss finish presentation box. Please keep your text to a minimum i.e. two names and a date. If you require more than this please contact us first before placing your order.